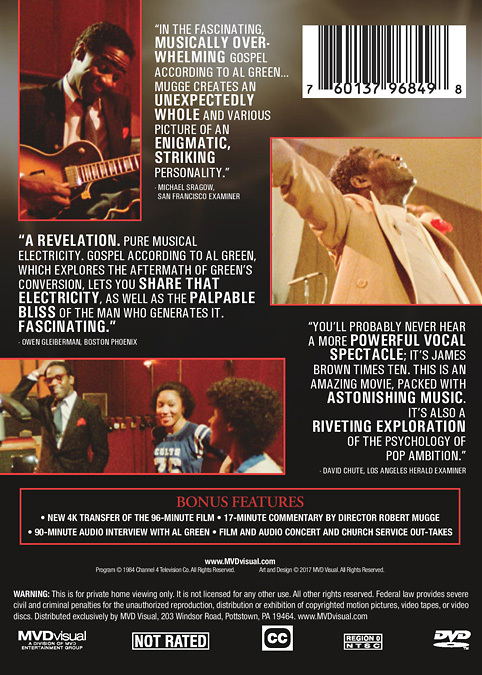 A 94-minute portrait of soul singer and gospel preacher Al Green filmed at a concert in Washington, D.C. and a church service in Memphis, TN. GOSPEL ACCORDING TO AL GREEN at the Coolidge Corner in Brookline, MA. Photos by Justin Freed. 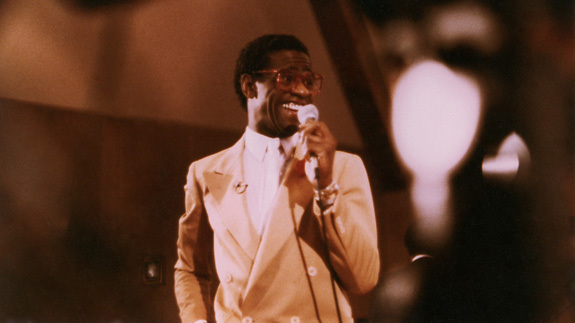 Al Green preaching and singing at his Full Gospel Tabernacle Church in Memphis, Tennessee, December 18, 1983. 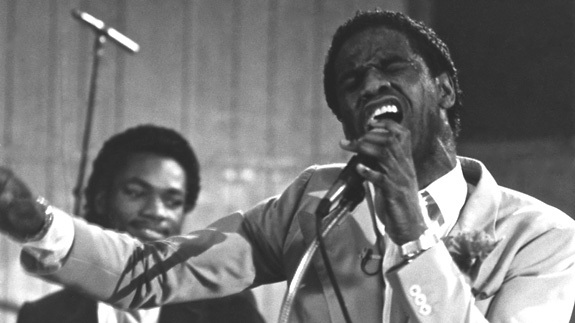 A classic documentary captures Al Green in the pulpit and onstage. 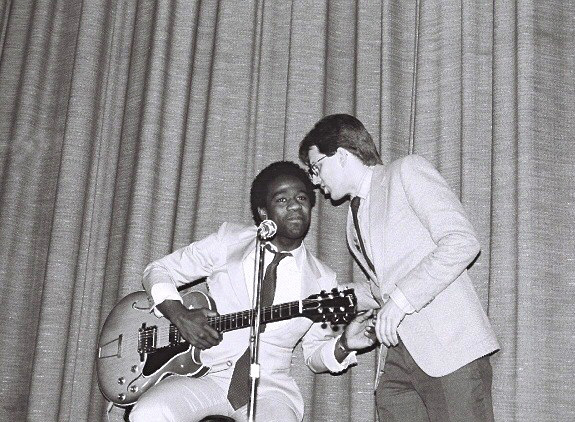 The first time I interviewed Al Green, on the phone, several years ago, the legendary soul singer took me by surprise. I'd been a huge fan of his music for years, but not only had I never spoken to him, I had never seen or heard him interviewed. Green's speaking manner was nearly as idiosyncratic and dynamic as his one-of-a-kind vocals. Not only was his normal conversation sing-songy, he would break, literally, into song. Asking a question about his music's connection to Motown, Green burst into Temptations and Smokey Robinson songs. Throughout the interview, when songs were mentioned, he would occasionally dip into them, weaving bits of singing in and out of the conversation. 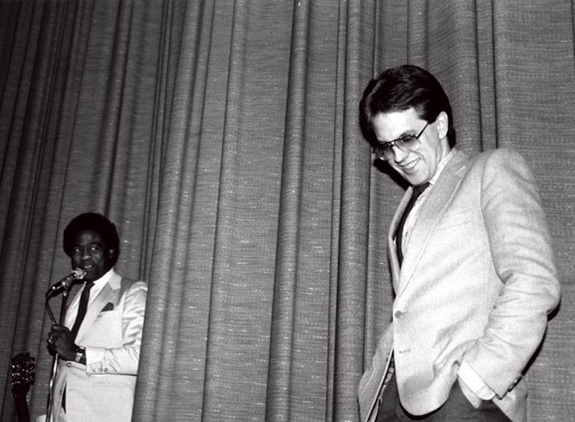 Had I seen filmmaker Robert Mugge's 1984 documentary Gospel According to Al Green, I might have been better prepared. In that film, Green is first seen in his home studio, being interviewed while plucking an electric guitar. "I love you with all my heart," he sings, picking out a few notes and making the cliché soar. A few minutes later, Green tells the story of playing a show in Dallas, early in his career, and not getting paid. Driving back home to Michigan, a girlfriend with him, he sings a new song he'd written, "Tired of Being Along." Strumming the guitar the whole time, Green interrupts his own story periodically to sing the song's opening verse or chorus. "The girl said, 'Would you please put that thing down? You're driving me nuts,'" Green remembers with a grin. "But I was gone on that song." Green's way of speaking is almost fey — downright cutesy — as stylized as his singing. In the mid-'70s, critic Robert Christgau — a big fan — wrote of Green's speech: "The man crinkles up his voice as if he's trying out for Sesame Street; he drawls like someone affecting a drawl; he hesitates and giggles and murmurs and swallows his words." Green is having a very good year. His 2008 album Lay It Down, was the best of a fine trio of recent secular "comeback" albums. A few weeks ago, the album garnered Green two Grammys on a night where he dueted with fellow Mid-Southerner Justin Timberlake on his classic single "Let's Stay Together." 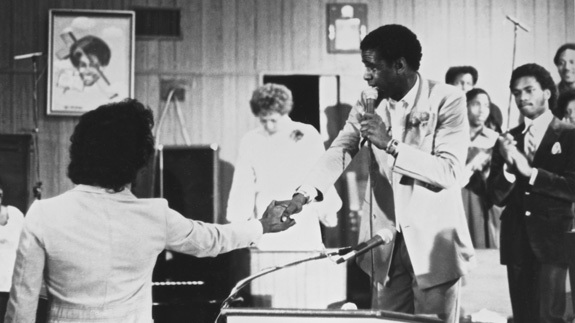 Soon after Green's big Grammy moment, the long-unavailable Gospel According to Al Green received a 25th-anniversary DVD release, allowing viewers a remarkably intimate glimpse of Green in the days not long after he'd essentially abandoned secular music for the pulpit. Mugge is a documentarian who specializes in making films about American music, including such high-profile works as Deep Blues, Saxophone Colossus (a film about jazz great Sonny Rollins re-released concurrently with Gospel According to Al Green), and the post-Katrina New Orleans Music in Exile. 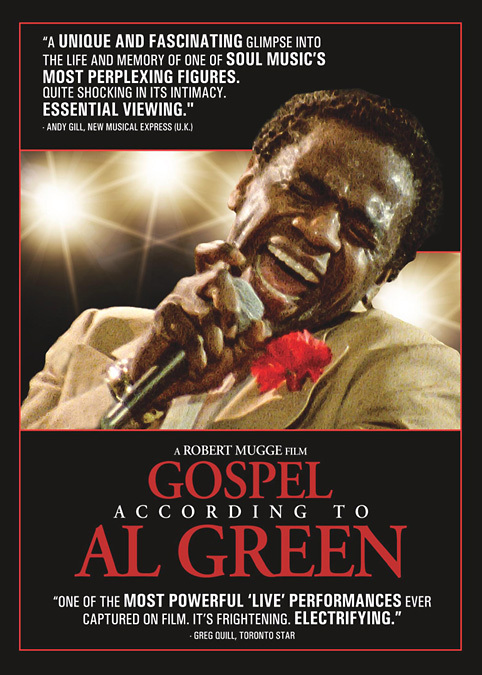 Gospel According to Al Green was one of Mugge's first films, but the director apparently sees it as a template for his subsequent work. 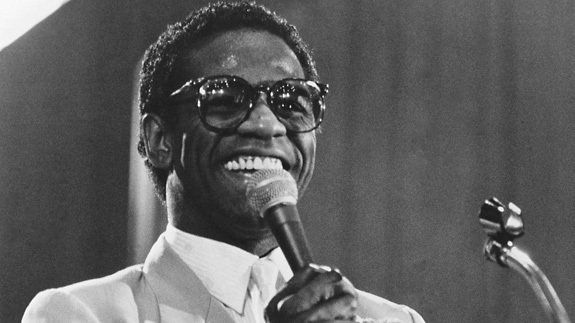 In a new interview that is one of the new edition's special features, Mugge says, "In many respects, Gospel According to Al Green is exactly what I want my films to be: It captures a musical artist at the peak of his powers; it develops many themes related to traditional American music; and it presents a dramatic story." That story is part of pop-music lore: how Green, a journeyman Michigan soul singer with Southern roots, was discovered by Memphis producer Willie Mitchell at a Texas club and lured to Tennessee; how Green and Mitchell worked to perfect a soul sound that bridged the divide between '60s grit and '70s silk; the dramatic incident where Green was scalded with hot grits by an upset lover, who then killed herself; how Green had a religious awakening, abandoning pop music for the pulpit in the form of his own Memphis church: the Full Gospel Tabernacle on Hale Road. This story has never been told with such intimacy as in Gospel According to Al Green. Green was candid on these subjects in his 2000 autobiography Take Me to the River, but here you hear the words in Green's amazing voice and you can watch, rapt no doubt, as he performs his life story with the same charisma as he performs his great songs. 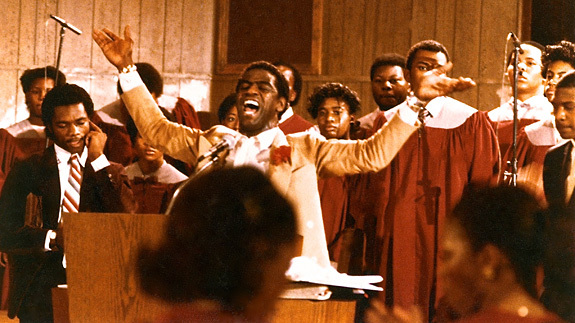 Gospel According to Al Green captures its subject in three primary settings: alone in his home studio, onstage at Bolling Air Force Base in Washington, D.C., and, finally, in the pulpit at Full Gospel Tabernacle. 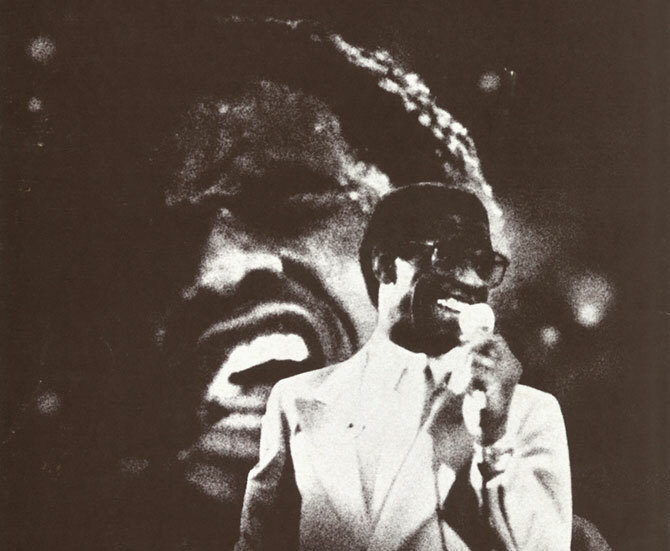 The only other subjects who get much screen time are Willie Mitchell, interviewed at Royal Studio, where most of Green's greatest work was recorded, and the pop critic Ken Tucker, who calls Green a synthesis or the soft, wounded style of Smokey Robinson and grit of Wilson Pickett. Originally, Mugge says in his DVD extra interview, there were other outside talking heads in the film and the director had included himself as an on-screen subject. That material didn't test well in early screenings: The audience just wanted to watch Green talking, singing, and preaching — performances all. At Bolling, Green stretches out Curtis Mayfield's "People Get Ready" and goes deep into the gospel standard "Nearer My God to Thee" while walking off the stage and into the crowd. In the studio, he's riveting, talking candidly about the "grits" incident and his middle-of-the-night religious awakening. Most memorable is his description of his impulsive purchase of his church. "You know how I wrote the check?" Green asks, reaching into the breast pocket of his suit and pulling out his glasses. "Out of a little book I had in my pocket. Just a little pad book. Not even a real, real, real book. Just a little pad book. "I wrote the check right on out for the whole building," Green says, running his fingers over his glasses as if they were the checkbook. "And signed it," he says, waving his hand dismissively. "Through with that. 'Cause see, now, Sunday I'm preaching. That's all." Mugge holds back on Green's church service until the final third of the film, when he surprisingly gives Green in the pulpit roughly half an hour of uncommented-on screen time, where you notice how little difference there is between Green's three public sides: speaking, singing, and preaching. Green is, here, improvisational, his voicing ranging between speech and song. "This is a film about love," Mugge says. 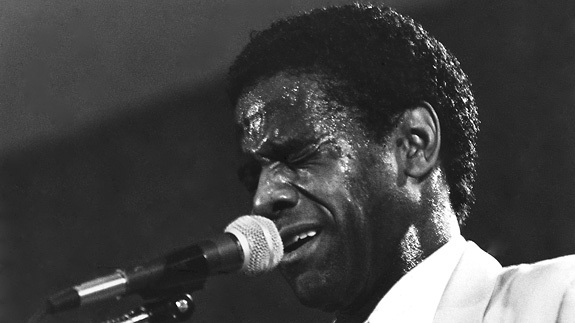 "About the connections between soul music and gospel, and about a guy who flew too close to the sun, got his eyeballs burned, and has been singing ever since with fire coming out of his mouth." And to borrow a title of one of Green's many terrific '70s albums, he's nothing if not full of fire here.